Damien Cato never imagined that a high school job working at H-E-B would transform his professional career. Cato will graduate this December with a bachelor’s in management. Cato began working for H-E-B in 2012. When he enrolled at UTSA in 2014, he wasn’t sure of his career path, but he had a drive to help others. He soon realized that a career with H-E-B allowed him to fulfill his professional aspirations as well as his dedication to serving others. Throughout his tenure he has served in various roles. After graduation he will be promoted to service lead and manage the front end of the 1604/Bandera store with over 150 partners. 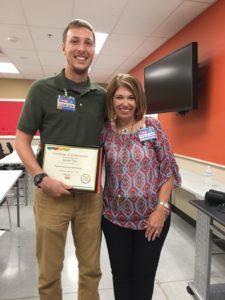 The demand of being a full-time employee might discourage many students, but Cato managed his time wisely so he could be successful both at UTSA and H-E-B. He was recognized for his academic achievements by being named to the Dean’s List, received an H-E-B scholarship, volunteers with the Food Bank and participated in the H-E-B Partner Development Program.